The University of Notre Dame’s student news magazine, Scholastic, has received top honors from the Indiana Collegiate Press Association. Scholastic was named 2013 Newsmagazine of the Year, winning 25 awards in news, sports, feature and opinion writing and in design, photography and illustration. The publication, which appears monthly, began as a weekly newspaper and has been published continuously since 1867, making it one of the oldest continuously published student magazines in the country. Scholastic is sponsored by the Office of Student Affairs. The Indiana Collegiate Press Association is made up of 45 student newspapers, magazines, yearbooks and online publications from throughout Indiana. The goal of the association is to create fellowship and cooperation among Indiana’s collegiate journalists. The awards were presented at ICPA’s annual convention, held April 12-13 at Indiana University in Bloomington. 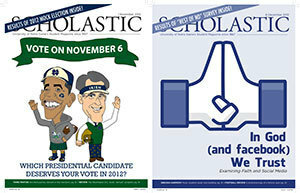 Scholastic’s editor-in-chief this year is Clara Ritger, a senior from Huntington Beach, Calif.
Two other Notre Dame student publications came in second in their categories in the ICPA awards. The Dome, Notre Dame’s yearbook since 1906, was runner-up for Division I Yearbook of the Year. The University’s literary magazine, The Juggler, was runner-up for Literary Magazine of the Year. Both The Juggler and The Dome are sponsored by the Office of Student Affairs. Notre Dame’s independent daily student newspaper, The Observer, also earned recognition at the ICPA awards. It took awards in photography, pull-out section, editorial and reporting categories, as well as placing third in the Division I Newspaper of the Year category. Andrew Owens, a senior at Notre Dame, won the ICPA’s Brook Baker Collegiate Journalist of the Year Award, a recognition honoring the memory of Baker, a Vincennes University student journalist who worked tirelessly for her staff. Owens has worked for four years at The Observer, serving as reporter, editor and a mentor for writers. He has completed internships at the South Bend Tribune and Los Angeles Times, covering sports stories. His work for The Observer includes a story about his travels to the site where Notre Dame coach Knute Rockne’s plane crashed in Kansas, and an in-depth profile of Irish linebacker Manti Te’o. Originally published by Notre Dame News at news.nd.edu on April 16, 2013.